Aerosol Measurement: Principles, Techniques, and Applications Third Edition is the most detailed treatment available of the latest aerosol measurement methods. Drawing on the know-how of numerous expert contributors; it provides a solid grasp of measurement fundamentals and practices a wide variety of aerosol applications. 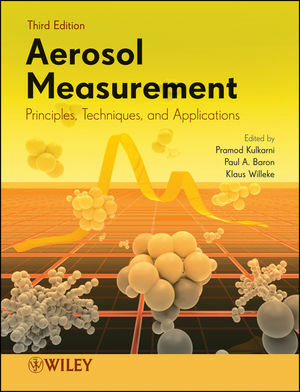 This new edition is updated to address new and developing applications of aerosol measurement, including applications in environmental health, atmospheric science, climate change, air pollution, public health, nanotechnology, particle and powder technology, pharmaceutical research and development, clean room technology (integrated circuit manufacture), and nuclear waste management. PRAMOD KULKARNI DSc, is a Physical Scientist, Senior Service Fellow, at the Centers for Disease Control and Prevention, National Institute for Occupational Safety and Health, and an Adjunct Assistant Professor in the Environmental Engineering and Science Program at the University of Cincinnati. The late PAUL A. BARON PhD, was a Physical Scientist at the Centers for Disease Control and Prevention, National Institute for Occupational Safety and Health. KLAUS WILLEKE PhD, is Professor Emeritus of Environmental Health at the University of Cincinnati.